SF14 Session 3: Dr Bridget Hamilton: Nurses’ own health: a problem. 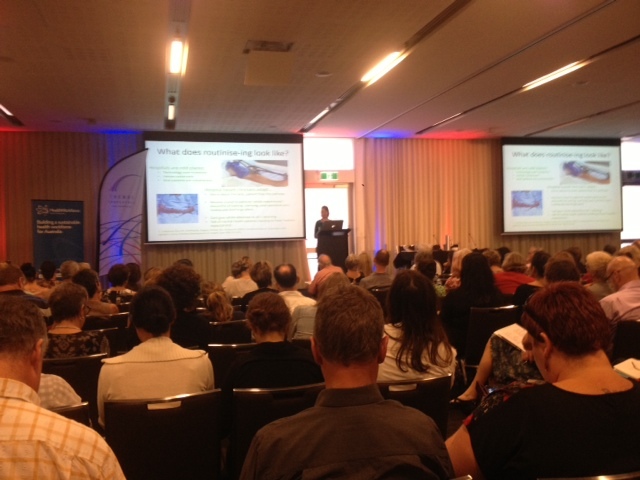 - TheMHS Learning Network Inc.
SF14 Session 3: Dr Bridget Hamilton: Nurses’ own health: a problem. Dr Hamilton began her talk by taking us inside the nurse’s world of work. She explained that approximately half of mental health workers are employed within hospital settings and face different challenges and restrictions compared with their non-hospital counterparts. Specifically, those who work in hospital settings are exposed to more experiences of assault and restraint/seclusion interventions. Along with the dramas of physical traumas witnessed within the Emergency Department, nurses are routinely exposed to the extremes of human emotion and behaviour. According to Dr Hamilton, many nurses begin their career idealistically motivated and welcome the idea of working with people in extreme situations of distress and suffering. Indeed, some research has focused on the protective role of nurse’s perceptions that they can effectively bring comfort to patients during times of need. Dr Hamilton explained that the essential role of the nurse is to “dampen down” trauma. Given the demands and difficulties within the hospital setting, it is not possible for nurses to consistently respond to distressing situations in an empathic manner. According to Dr Hamilton, nurses seek to organise and create routines to create a safe and predictable setting of order and structure. Hospital wards are therefore industrial and regimented environments in which experiences of dehumanization can be common. For nurses under pressure to protect the hospital routine from chaos, the hospital setting begins to feel like a machine that needs to be kept in motion. Hospital-based clinicians adapt to this culture, and commonly worry about the number of beds and patient flow. Dr Hamilton explained that within the hospital setting, nurses can become inured to patients’ whole experiences including the discomforts of waiting, worrying, post-operative pain and inadequate discharge plans. It is essential for nurses to ration their attention as it is not possible to give one’s whole attention to one patient. Dr Hamilton moved to speaking about research on stress experienced by mental health nurses. A 2011 study investigated nurses’ experiences of violence and post-trauma symptoms in both Forensic Mental Health and Acute Adult Mental Health settings. This investigation found that 1/3 of the nurses met criteria for psychological distress and this figure is 8 times the level of the general Australian population and higher than distress levels of emergency workers. The study found that nurses’ distress did not differ across the two settings and that levels of distress were not related to rates of reported aggression. Dr Hamilton also spoke of the Foresight project, a research initiative conducted in the United Kingdom in 2008. Dr Hamilton focused on one component in particular: wellbeing at work. This investigation of nurses’ experiences found that a number of workplace factors were related to nurses’ wellbeing. Job security was one such factor and those with less job security (casual employment) reported higher rates of trauma symptoms. The strongest protective factors for nurses were quality of relationships with peers, and receiving adequate clinical supervision and support from management. Nurses also identified expressions of acknowledgement and appreciation of their work as highly valued. Nurses also reported feeling distressed and bitter when they felt blamed, particularly for things they didn’t have a lot of control over (e.g. incidents on the ward). Nurses reported that it is very difficult to complete tasks due to high pressure in the hospital work setting and that feeling blamed for this is a very negative experience. As a result of such experiences, nurses can become more rule-bound and disconnected in their interactions with patients. Dr Hamilton expressed that when nurses are struggling with trauma and burnout, peer response is critical and nurses need to feel supported by their peers and supervisors. She spoke of the Nursing and Midwifery Health Program Victoria, an initiative that provides independent support service for nurses, midwives and students of nursing and midwifery experiencing health issues related to their mental health or substance use concerns. This program provides individual support workers to assist nurses in such issues. This support person is available flexibly and commonly assists with the relationship between the person and his or her employer, assisting nurses to navigate difficult workplace processes. This initiative also ran peer support groups to provide nurses with a much-needed support network with colleagues. Rhodes, Lorna A. Emptying Beds: the Work of an Emergency Psychiatric Unit, Berkeley: University of California Press, 1995. Chambliss, Daniel. Beyond Caring: Hospitals, Nurses and the Social Organization of Ethics. Chicago: University of Chicago Press, 1996. Next Post2014 Mental Health MEDIA Achievement Awards: Applications Are Open.